Lauric acid, also known as dodecanoic acid, is a type of saturated fatty acid. A saturated fat can be detrimental in high quantities, but lauric acid has microbial properties, so it can help protect against bacterial infection, notes Paul May, professor at Bristol University in England. Not that many foods contain high amounts of lauric acid, though you can find some if you look hard enough. Some of the fatty acids found in coconut oil are lauric acid. 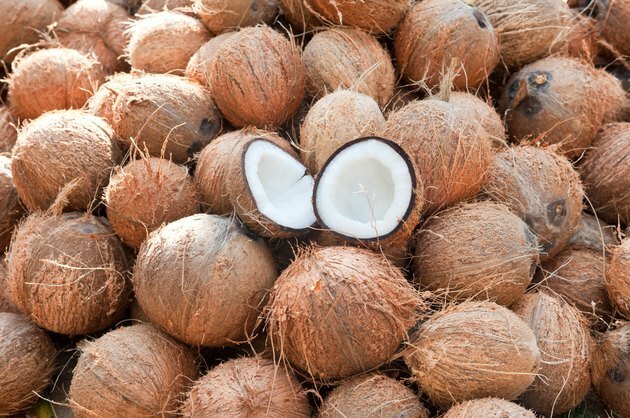 It is this lauric acid, along with another fatty acid -- caprylic acid -- that give coconut its antiviral and antimicrobial properties, according to nutritionist Jonny Bowden. To get the benefits of lauric acid from coconut, try cooking in coconut oil, adding coconut milk to curries or blending shredded coconut in protein shakes or smoothies. Coconut oil is roughly half lauric acid, so it has about 6.5 grams per tablespoon. Lauric acid is also present in high amounts in palm kernel oil. The fatty acid ratio in palm kernel oil is very similar to that of coconut oil. Just make sure that you specifically look for palm kernel oil. Regular palm oil contains very little lauric acid, whereas almost half the saturated fat content of palm kernel oil comes from lauric acid. A tablespoon of palm kernel oil weighs around 13 grams, with 82 percent of this being saturated fat. This gives a total saturated fat content per tablespoon of 10.7 grams and a lauric acid content of just over 5 grams. A more common food source that contains lauric acid is milk. The type of milk highest in lauric acid is actually human breast milk, but cow's milk and goat's milk are good options. Lauric acid makes up just under 3 percent of the total fat in cow's milk and just over 3 percent of the fat in goat's milk. A cup of whole milk has just over 8 grams of fat, yielding about 0.25 gram of lauric acid per cup. While lauric acid may have certain benefits, there is no set recommended daily allowance for it. According to nutritionist Mary Enig, consuming between 10 and 20 grams of lauric acid per day could be beneficial for adults and growing children. As sources of lauric acid also tend to be high in saturated fat, however, limiting them may be wise, unless otherwise advised by a medical professional. The U.S. Department of Agriculture recommends limiting your saturated fat intake to less than 10 percent of your total calorie intake. This means that on a 2,000-calorie-per-day diet, you should consume no more than 200 calories worth, or 22 grams, of saturated fat.